Black SBC Serpentine Conversion Kit - AC & Power Steering, Electric Water Pump. Black Chevy Small Block Serpentine Conversion Kit - Electric Water Pump (EWP). Air Conditioning, Power Steering & Alternator Applications. The BeastTM&###xA0;8 Track Serpentine Pulley Kits feature 8 ribbed serpentine pulleys for 30 percent more grip than traditional 6 rib pulleys. This pulley kit has been CNC machined in the USA from a solid 6061-T6 Aircraft quality Alumimum to ensure that it is balanced and as strong as possible. We then hand polish each part so that it really makes your engine stand out from the crowd. Don't spend hundreds or thousands of dollars building your engine and then throw a set of flimsy brackets or out of round pulleys on the front of the engine. &###xA0;Those flimsy brackets will flex with today's higher horsepower engines and you will end up throwing belts all over the road! &###xA0; Our billet aluminum brackets&###xA0;reduce weight and provide a more rigid mount&###xA0;than&###xA0;any chrome or steel bracket on the market. 283, 302, 305, 327, 350, 400 Chevy Small Blocks. Saginaw P Series Power Steering Pump with Keyway Shaft. Corrosion Resistant Hardware from Fastenal&##xAE. CNC Machined from 6061-T6 Billet Aluminum. MADE IN USA (Not China or Taiwan like most E-bay Listings). AC Compressor, Power Steering Pump, Alternator, Water Pump and Belts are Not included. &###xA0;We can accomodate most applications. 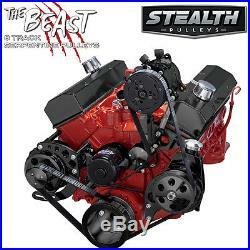 Black Chevy Small Block Serpentine Conversion Kit - Electric Water Pump (EWP) Air Conditioning, Power Steering & Alternator Applications The BeastTM 8 Track Serpentine Pulley Kits feature 8 ribbed serpentine pulleys for 30 percent more grip than traditional 6 rib pulleys. Those flimsy brackets will flex with today's higher horsepower engines and you will end up throwing belts all over the road! Our billet aluminum brackets reduce weight and provide a more rigid mount than any chrome or steel bracket on the market. Applications: ---Electric Water Pump ---283, 302, 305, 327, 350, 400 Chevy Small Blocks ---Saginaw P Series Power Steering Pump with Keyway Shaft ---Sanden 508 Style Compressor Kit Includes: ---Crank Pulley ---Alternator Pulley ---Power Steering Pulley ---Alternator Bracket ---Power Steering Bracket ---AC Compressor Bracket ---Universal Alternator Fan ---Corrosion Resistant Hardware from Fastenal&###xAE; Features: ---CNC Machined from 6061-T6 Billet Aluminum ---Polished Aluminum Finish ---MADE IN USA (Not China or Taiwan like most E-bay Listings) ---All Hardware Included AC Compressor, Power Steering Pump, Alternator, Water Pump and Belts are Not included. We can accomodate most applications. The item "Black SBC Serpentine Conversion Kit AC & Power Steering, Electric Water Pump" is in sale since Saturday, March 25, 2017. This item is in the category "eBay Motors\Parts & Accessories\Car & Truck Parts\Engines & Components\Belts, Pulleys & Brackets". The seller is "cvfracing" and is located in New Prague, Minnesota. This item can be shipped worldwide.